* Indicates the earthquake return period. 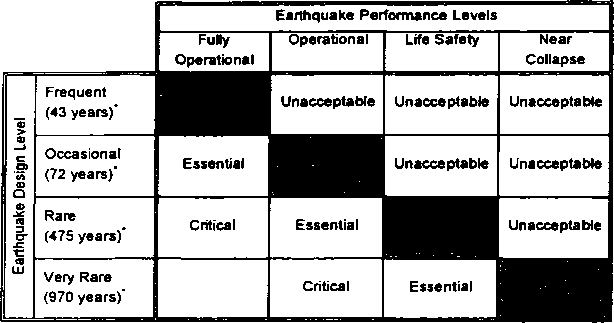 A performance objective Is the combination of an expected performance level with an expected level of earthquake ground motion. The selection is made by the client based on consideration of the client's expectation's, the seismic hazard exposure, economic analysis, and acceptable risk. Selecting the performince objectives sets the acceptance criteria for design. A site autabWy analysis Includes consideration of the site aelamidty, soil type, and potential site hazards, and detenrination of the sol profile and topography Identification of seismic source« and mechanisms, and tdentitieation of Hquifacbon potential, tsunami exposure, and other hazards. The design ground motions should be determined from a seismic hazard analysis that considers a» critical seismic sources. The form In which the ground motions are characterized (e.g. time histories, acceleration response spectra, or daplacement response spectra) stolid be suitable for the analysis and design methods. The conceptual deaign of a buldng establishes the overall layout, configuration, selection of structural systems and materials, selection of foundation systems, and selection of non-structural systems. The portions of the structural system that wW be expected to yield and dMpete the earthquake input energy should be Identified. During the preMmjnary design phase, structural framing elements are sized and checked against the design criteria. As a minimum, the deaign should be checked for operational performance and for life safety or ooNapse prevention perfornanoe. Elements of the structural system that wHI be expected to dissipate energy during an earthquake should be proportioned to provide the Intended inelastic performance. During the final design phaee, the structural system Is detailed to meet all of the selected performance objectives. Particular attention should be focused on the detsls of those elements that must provide ducttity to ensure acceptable inelastic performs nee. 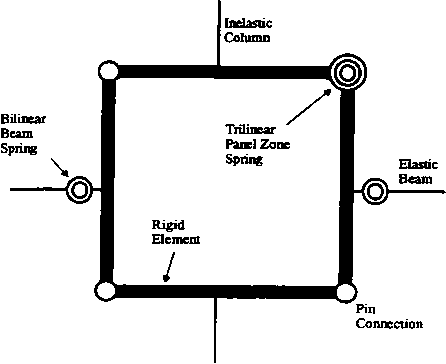 Non-structural elements are designed end detaled to accommodate the etssbc and inelesHc deformations of the structure. Folowing each design step, a de^gn verification analysis Is performed to verify that the design satisfies the selected performance objective* Depending on the performance objectives snd building configuration, either elastic or Inelastic analysis methods are used to caiculata the structural respones to the design earthquake ground motions. Calculated structural reaponss quantities are oompsred to NmMing values aaaodatad wth the aaleded performance objectives. Quality assurance during construction Involves the design professions!, peer reviewer, building official, spedel inspectors, testing agencies, and the contractor. The quality assurance process ensures that the design Intent is property Interpreted and that the critical elements sre recognized, properly constructed, inspected, and tested In accordance wrtth the applicable building codes. During the life of the structure, the bulding owner and buldng official must ensure that the earthquake resisting system is not sltered during future remodels or renovations. The owner must maintain the structure to prevent corrosion snd deterioration of the buMdng elements snd to ensure that changes In occupancy and building taction do not adversely affect the behavior of the bulding.